A toy store near you is to have a ‘Turtles-tastic’ visit from the Teenage Mutant Ninja Turtles on Saturday 9th November, Saturday 16th November and Saturday 23rd November! With photographic opportunities and the chance to win big with a national competition, the Teenage Mutant Ninja Turtles will be supporting fab toy stores near you over a three week period. Check out the schedule below to see when you can visit! This Saturday, Donatello and Michelangelo will be in store at Smyths Friern Barnet from 11:00am where kids will be able to have their photographs taken with the Turtle duo. Plus, unique coded postcards will be handed out during the event for a chance to win a visit from all four Teenage Mutant Ninja Turtles and their Shellraiser vehicle, Flair toys including playsets, vehicles and figures as well as on-the-day gifts of tattoos and bandanas. 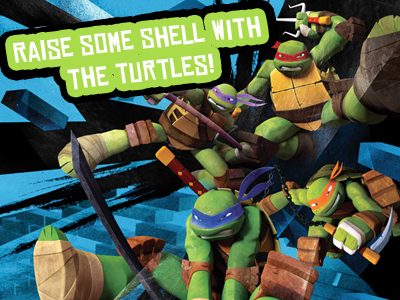 Toys R Us – Thurrock from 3:30pm – All four turtles will be appearing until 5pm!! Don’t worry if you can’t make these visits as there are more to come on the 16th November and the 23rd November! Sounds great, hope they come and see us northerners!